Brussels and leading European capitals have a lot of complaints against the United States. However, knowing perfectly well that this is impossible, since they have different weight categories, the Europeans decided to punish his main European ally, Britain, in front of Washington, because this old pirate kingdom had seriously offended Brussels with a successful referendum on leaving the European Union and impudent demands at the divorce negotiations . Especially - by their desire to preserve all the advantages of “cohabitation” with the EU, while excluding all the disadvantages. But it does not happen. At the latest EU summit in Salzburg, German Chancellor Angela Merkel refused to shake British Prime Minister Teresa May's hand, and in the group picture she completely obscured her dimensions with a more stylish British lady, who was not delayed at this event for a long time. European Commission President Jean-Claude Juncker constantly humiliates Britain, saying, for example, that he has the feeling that this EU is coming out of Britain, and not vice versa. Although if Brussels and London fail to agree on the terms of a “divorce,” British aircraft would not even be able to land in continental Europe. “The October Council, which will be held next week, will be an important stage. We expect it to be the very moment when we will achieve some progress, ”said Dominic Raab, Brexit Minister, at the House of Commons of the British Parliament. According to him, in recent weeks, the dialogue between London and Brussels has intensified, and the parties "are getting closer and closer to acceptable solutions." At first glance, very encouraging words. However, by the middle of October, the parties had to reach an agreement for this summit, since it was generally planned to adopt a document on the future nature of bilateral relations on the basis of the agreements reached. Now the achievement of an agreement in principle is postponed - at the beginning of November. With this it will be possible to draw more, replacing the discussion of mutual disagreements in the official agenda by condemning Moscow on the results of old or new anti-Russian provocations. However, no matter how much time politicians pull, Brexit will appear on the night of March 29-30, 2019. And this is very soon. It will be very difficult to beat your fate to the British, who have already greatly regretted that they decided to do this. And only the Labor Party, in the event of a probable victory in the next parliamentary, possibly early elections, can try to decide to offer the British to re-speak on this issue, since it had previously opposed a break with Europe. The feasibility of the attempts of the May government, despite the indignation of the opposition, which is still vehemently supporting Brexit within its own party, to implement the option of a “soft divorce” with the EU - the so-called “Checkers plan” - raises great doubts. As well as reports that the adviser to the British prime minister on relations with the EU, Oliver Robbins, allegedly managed to make substantial progress on the future of the Northern Ireland border with Brussels-based negotiator Michel Barnier. It turns out that both sides want to preserve the “transparency” of this border for people, goods and services, but they have not yet figured out how to do this. And they are unlikely to come up. After all, if Ulster is left in the European Customs Union, it will cease to be part of the British, and if not, the border between both parts of Ireland will cease to be “transparent”, and nationalist, separatist and intercommunal ulcers can reopen on the newly divided Green Island. , not to mention the economic losses. Transparency of the border through Ireland can be ensured only in one case - if all of Britain does not leave the single economic space of the EU, if it cancels Brexit and, like a prodigal son or a harlot, returns to Brussels. That would at least be honest. There was no procedure for withdrawing member states from the EU. And the world has become so complicated, especially in the economic sphere, that it was very difficult to imagine in advance all the difficulties and the incredible problems associated with a “divorce” from the EU. This has to be dealt with now, when emotions have largely receded. And in conditions when Britain is all alone, and the United States, on the other side of the Atlantic, is not in too much of a hurry to help. 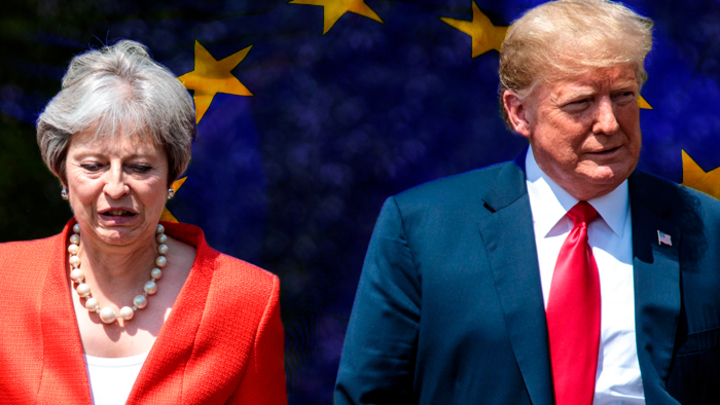 President Donald Trump needs all of Britain, with all the guts, Washington is not going to share it with the EU. And what will happen with the new American administration - who knows? To focus in such an uncertain situation on Washington is more expensive. Therefore, Teresa May has to, deliberately diverting public attention to the machinations of "insidious Russia", to bear frank nonsense that she will temporarily keep Britain in the EU, but subject to the launch of the exit process. About this "strategy" told the Times today. This May's step will be an application for the collapse of her office. According to the Times, despite the prime minister’s clean-up and removal of a number of prominent figures such as ex-foreign minister Boris Johnson and former Brexit executive David Davis, even their replaced ministers can oppose May. Specifically named in this regard is the new Foreign Minister Jeremy Hunt, Interior Minister and Conservative Rising Star Sajid Javid, Dominic Raab, Minister of the Environment, Food and Rural Development Michael Gove. All of them have supported May, but are known for being strongly opposed to further "concessions" to Brussels. These figures represent the influential wing of the Conservative Party, where they consider the “Canadian option” the best way to settle relations with the EU - something like the Comprehensive Free Trade Area Agreement (CETA) between the EU and Canada, which, by the way, will also be very difficult to conclude Britain's long membership in the EU. But such an agreement, unleashing the hands of Britain on many issues, will put an end to the free movement of labor and lead to the appearance of a real border between both parts of Ireland. In general, the circle is closed. Thus, it turns out that in the face of Brussels 'rejection of the Checkers' plan and the unacceptability for May of the entourage of the EU’s further "concessions", the only real way to resolve the British-European contradictions is ... catastrophic Brexit. That is, a divorce without any agreements at all, which will be very painful for all parties to the conflict, but for the British - three or four times or more painful. In this situation, the “dancing queen” simply cannot dodge early elections. And you can even foresee what they end up with: the defeat of the conservatives entangled in Brexit, the complete chaos in the British ruling class and the victory of the Laborites.